The oil drillers have both made big investments in Texas. Which is more likely to pay off for investors? When you invest in an oil exploration and production company, you'd better be prepared for a wild ride. Stocks of drillers like Apache Corporation (NYSE:APA) and Marathon Oil (NYSE:MRO) are usually the first to be affected by energy industry news, and can see big swings. And unfortunately over the last few years, it's mostly been down. Let's look at Apache and Marathon -- both of which have seen big share price drops in the last three years -- to pick out the better buy today. Apache and Marathon have made substantial investments in West Texas and New Mexico. Image source: Getty Images. 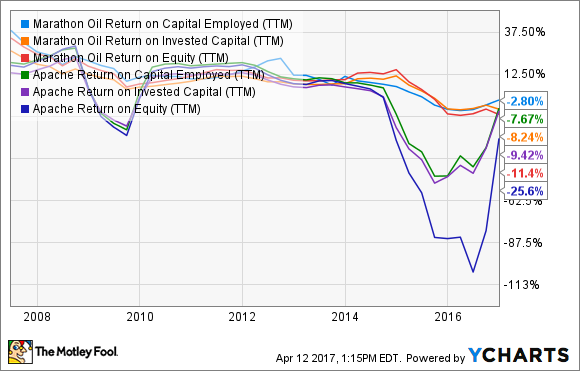 MRO Return on Capital Employed (TTM) data by YCharts. All three of Marathon's returns metrics have moved pretty much in tandem with one another for years. The same is true for Apache's. In fact, for most of the last 10 years, the companies' returns have practically mirrored each other. But when times are tough, like during the Great Recession in 2008-09 and during the current oil downturn, the differences are stark: Apache's returns drop significantly while Marathon's remain comparatively stable. In 2008-09, that made sense since Marathon hadn't yet spun off its midstream and downstream operations -- which it did in 2011 as Marathon Petroleum Corporation. That gave the company a layer of operational stability during the recession that Apache lacked. But the recent dip is troubling, not least because other production and exploration companies like ConocoPhillips are seeing returns nearly identical to Marathon's. Contemporary oil exploration and production companies are essentially modern-day prospectors, so it's important to look at, well, their prospects. Apache's prospects have gone from dim to bright with its recent discovery of massive petroleum reserves under 300,000 acres it had bought in an underdeveloped area of the West Texas portion of the Permian Basin. This "Alpine High" find was something of a surprise to the industry, which hadn't previously thought there was much hydrocarbon potential there. As a result, Apache's stock surged, and it now has excellent prospects for increasing its production down the road. You see, part of the downside of buying acreage in an underdeveloped area is that there's no existing energy infrastructure to support new drilling and pumping activity. Apache is going to need to spend 2017 building out that critical infrastructure to ensure that it can get its Alpine High gas and oil out of the ground and where it needs to go. Following Apache's huge find, plenty of companies started looking to the Permian Basin for their future prospects, and Marathon is no exception. In early March, the company sold its Canadian oil sands subsidiary for $2.5 billion, paying $1.1 billion of that cash for 70,000 Permian Basin acres in New Mexico. In late March, it followed up with a $700 million purchase of 21,000 additional Permian Basin acres. It's worth pointing out that Apache's average cost for its Permian Basin purchase was $1,300 per acre, while Marathon's March purchases cost it nearly $20,000 per acre, so while both companies' prospects here are good, I'm giving the edge to "first mover" Apache and its large, inexpensive holding. While you're waiting for those Permian Basin prospects to pay off, a dividend can offer you a reward for the wait, as well as a steady stream of cash that's generally immune from the wild fluctuations of the energy sector. Trouble is, neither Apache nor Marathon is paying much of a dividend these days. Marathon's dividend was once a thing of beauty, yielding nearly 5% in late 2015. Of course, the reason that yield got so high was because the stock price was rapidly falling. So management made the smart move and slashed the quarterly dividend from $0.21 per share to a meager $0.05 per share, which currently amounts to a paltry 1.2% yield. Apache's dividend is better but not by much, at just under 1.9%. And both yields pale by comparison to the high-yielding integrated majors, like BP and Royal Dutch Shell, with 6.8% and 7% yields, respectively. However, Apache's quarterly payout of $0.25 per share has remained constant since early 2014. Even though it looks unlikely to grow substantially anytime soon, it seems unlikely to fall, either. Consistency wins here. While Marathon beats Apache on the consistency of its return metrics, Apache is currently sporting a (slightly) more attractive dividend and has good long-term prospects in its huge Alpine High holdings. Apache looks like the better buy.